Neal Adams is a notable creative force in comics. He modernized the art and inspired a generation of cartoonists. He championed the creators of Superman (Jerry Siegel and Joe Shuster) and helped them received awards, recognition, and pensions. Neal Adams is a fine cartoonist. He changed the look and style of Batman, Superman, and Green Arrow. He has been called “the greatest comic book artist alive” – a statement that Adams himself unabashedly repeats on his own website. He is epic with pen and pad, but he is wrong about geology. Adams’ video, Science: 01 – Conspiracy, begins with Richard Strauss’s Also Sprach Zarathustra which adds melodrama to his pseudo-science film. But instead of authenticity, the pretentious soundtrack made me laugh. Whenever you hear Strauss, you know that something of great importance is about to unfold. It’s like the alert siren used on public service announcements. In this case, it’s a call to don your tin hat and prepare to hear about yet another science conspiracy – this time, it’s geophysicists hiding the truth about the evolution of the Earth. Well, it looks like the world’s greatest comic book illustrator has unmasked us geoscientists. For years, we’ve been gathering in dark parkades, exchanging stuffed envelopes of incriminating geophysical formulae. Our goal: to promote the idea of plate tectonics, thereby gaining mastery of the universe. A minute into his video, Adams tells us “There is a kind of conspiracy of science among certain scientists. They know, but are not telling you, that…” Well, you can watch the video for yourself to see what we know but are not telling you. Drop into Neal Adam’s alternate reality website, nealadams.com, and you’ll be treated to the opportunity to buy his PDF as well as a couple dozen videos explaining his version of the Expanding Earth Theory. Before you do, though, you might want to become familiar with past iterations of the theory. You see, the idea of an expanding Earth has been around since the time of Sir Francis Bacon who (over 400 years ago) wrote that the Earth looks like an expanding flower blossom, as evidenced by the way the African and South American continents have apparently parted. 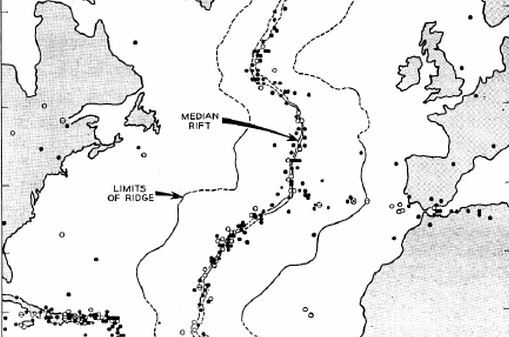 Heezen and Tharp’s Rift Map, 1957. In 1909, professional musician Roberto Mantovani wrote a popular science piece about the Earth expanding. More recently, a series of scientists put their voices to the idea. In the 1950s, Bruce Heezen (who inadvertently helped prove plate tectonics), co-discovered the great mid-ocean rift. He felt that the rift proved that the Earth was breaking and cracking as it expanded. His partner in science, Marie Tharp, believed they had found the source of continental motion and the cradle of oceanic crust. New crust formed at oceanic rifts, pushed the continents apart, then merged into the mantle at subduction zones. She was right; Heezen was wrong. Another bright geologist/geophysicist who promoted expansion theory was the Australian Warren Carey. Carey adopted the hypothesis of planetary inflation early in his career and advocated it with congenial vigour. Well liked, correct about many things, but rejecting plate tectonics, he clung to expansion as the explanation for the odd way that fossils and rock formations are distributed around the world. Late in his life, he continued to attend conferences and held court with a dwindling number of like-minded expansionists. Warren Carey, like Neal Adams, fell into the trap of promoting expansion while rejecting plate tectonics. It is not necessarily an either/or situation. Perhaps both drift and expansion are true. Is our planet expanding? Maybe. A Hungarian geophysicist, László Egyed, calculated that due to internal chemistry, the Earth’s radius increases by a millimetre, or less, each year. That’s imperceptible within the lifetime of a human, who may live on a planet that grows only a single hand’s width in a hundred years. Model of layered Earth: cooling may result in boundary phase changes. 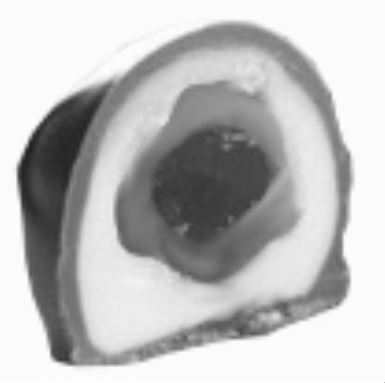 The cause of expansion, said Egyed, is a change in the materials at the hot boundaries between the inner core, the outer core, and the mantle. Expansion, by his theory, occurs along those adjacent zones. At each phase change, the Earth’s inner stuff becomes less dense. It expands. Egyed seems correct about those phase changes. They may really be happening, with inner core morphing into outer core, and outer core into mantle. If so, the planet might expand a millimetre a year. If Egyed is right, our planet’s rotation must slow so that angular momentum is conserved. The Hungarian geophysicist proposed a geomagnetic test, but the results are not yet clear. So far, geophysicists aren’t sure that our planet has expanded as Egyed suggested, but there is no conspiracy rejecting the idea. Instead, it’s examined and studied – as are any credible scientific theories. But expansion without plate tectonics can’t explain what we see on the Earth’s surface. For example, only plate tectonics accounts for the fact that the oldest seafloor is 180 million years old. Older ocean crust has subducted into the mantle. To account for the young age of ocean crust, expansionists say expansion just started 180 million years ago. Most expansionists think the planet has doubled in size within this brief window. Neal Adams rejects subduction, but he’s wrong. There is no doubt that heavy ocean crust is pulled under lighter continental crust at subduction zones. Geophysical data from three lines of evidence (gravity, GPS, and seismic) overwhelmingly prove subduction. What about Neal Adams’ idea that scientists conspire against him? It is hard to seriously study Adams (or anyone else) when part of their argument is that a group of us is quietly withholding secret knowledge about the way the world really works. Real science is quite the opposite. Scientists relish the idea of discovering that a theory is wrong. During the 1960s 70s, and 80s, hundreds tried to disprove plate tectonics. There is no better way to make one’s name than to revolutionize a field. But you’d better have the data to prove your idea. Neal Adams, in an interview that you can hear at this link, says continents have not twisted and turned, Pangaea never existed (“Everything about the Pangea theory is wrong scientifically. Everything is wrong.”), the Earth has more than doubled in size, mountains didn’t exist until 80 million years ago, subduction is physically impossible, and plate tectonics is wrong. On all of this, Mr Adams is mistaken. Sadly, in the interview, you will hear him give the wrong ages of oceans and mountains, incorrectly explain the evolution of fish, and show a total lack of knowledge about sea salinity and salt domes. Neal Adams’ breadth of misinformation is impressive. So is the fact that over two million people have watched his science video. We have empirical data – facts, not speculation – confirming continental mobility. These data come from real-time GPS measurements of the crust. Discrete plates twist and turn along paths that confirm plate tectonics and reject the simplified expansion model used by Adams. That does not mean that some expansion is impossible. But the overwhelming data says that Neal Adam’s theory is incorrigibly false. As Batman and Robin said, “Boom! Bash! Bang!” – continents collide tectonically, crust subducts, and the cartoonist is wrong. This entry was posted in Geology, Non-drift Theories, Plate Tectonics and tagged conspiracy, Egyed, expansion, Expansion Theory, geophysics, Heezen, Neal Adams, Tharp, Warren Carey. Bookmark the permalink. “Now what do you and I need to do to get 2 million views?” – Alas, it’s not going to happen for me in this lifetime! For you, perhaps. Your Primate’s Progress is worth at least 2 million views!